Christopher Eubanks knocks out No. 2 seed Michael Mmoh. 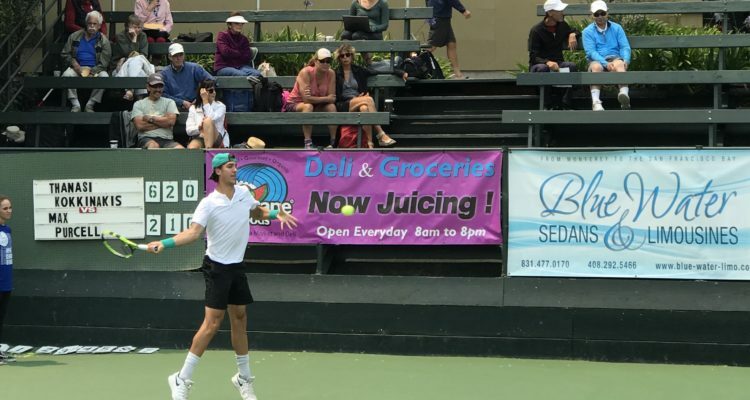 Thanasi Kokkinakis advanced to the quarterfinals of the $100,000 Nordic Naturals Challenger presented by Santa Cruz County Bank. The No. 4 seed from Australia defeated Kaichi Uchida of Japan 7-5, 6-0. Kokkinakis didn’t face a break point, converting four of his own 12 chances to prevail in one hour and 21 minutes. Next up for the 22-year-old Adelaide native will be Prajnesh Gunneswaran of India, who rallied past JC Aragone of the United States 4-6, 7-5, 6-4. The encounter lasted two hours and 29 minutes. Christopher Eubanks emerged victorious from the all-US-American affair with No. 2 seed Michael Mmoh. The World No. 236 from Atlanta outpointed his opponent 78-65 to secure victory in one hour and 23 minutes. Eubanks will take on compatriot Ernesto Escobedo in the stage of the final eight. This entry was posted in ATP Challenger Aptos, ATP Challenger Tour and tagged Aptos, ATP Challenger, Nordic Naturals Challenger, Thanasi Kokkinakis.